Back in 2017, we had excavated close to the rock art panel and found that deposits of quartz had been placed within fissures in the bedrock. We had placed small trenches to seek the remains of a putative cairn mentioned in a 19th century account. Cobbles were found on the highest part of the site, and these appeared to be contained by kerb stones. In 2018, further exploration found that this area of cobbles was disturbed by recent activity, including recent metal manufacturing, and we were unable to conclusively demonstrate the presence a cairn. The presence of so many cobbles of similar size in this location, however, could suggest that there may once have been a monument here. 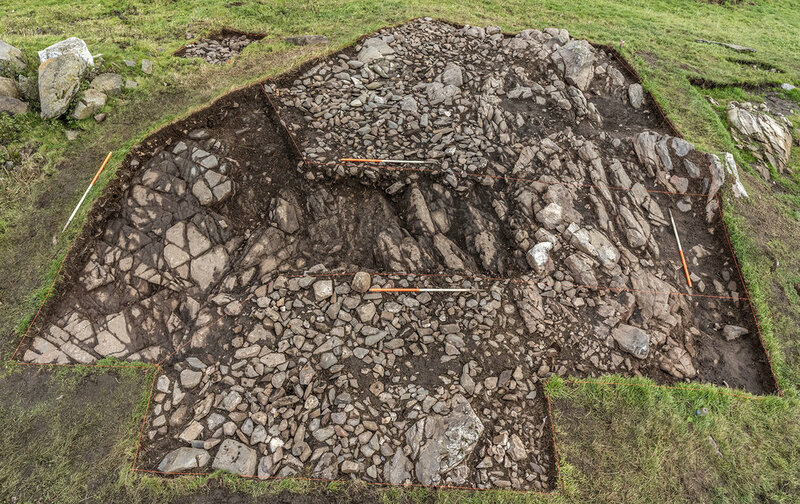 In addition, the kerb stones were revealed to be quartz-rich bedrock which, rather intriguingly, appears to have been shaped into a zig-zag pattern. Furthermore, the cup and ring marks were carved along an axis which is oriented towards the midsummer sunrise. In 2017, we found worked quartz artefacts placed among these carvings. Other cracks or fissures were marked by placed pieces of altered quartz. This continued tin 2018, and we found areas from which this quartz appeared to have been removed, although there was no evidence to suggest that people were making tools. Instead, it might have been the properties of the raw material itself which were important. Quartz not only sparkles in sun and moonlight, but also emits a magical optical effect known as triboluminescence when two pieces are rubbed or bashed together. This place appeared to be a convergence of cultural and natural features. The site as a whole takes the form of a glacial mound which resembles a built monument, including barrows that are found nearby. Perhaps the people who visited this place and made the cup and ring marks understood it to be the ruins of an already ancient structure. Although no dating evidence was found, we suspect these activities to be Bronze Age in date. A full account of the excavations, and our interpretations, will be published in due course.